Did This News Make Qualcomm the Best Semiconductor Stock on the Market? After two brutal years, there may be light at the end of the tunnel for Qualcomm. If the past two months have been rough for tech investors, the past two years have been downright miserable for shares of semiconductor giant Qualcomm (NASDAQ:QCOM). However, recent signals indicate the potential for a gradual shift in the years to come. As the company recently disclosed, it believes that its most meaningful recent headwind is likely to reverse down the road. But what could that mean for its sagging shares? Let's take a look. 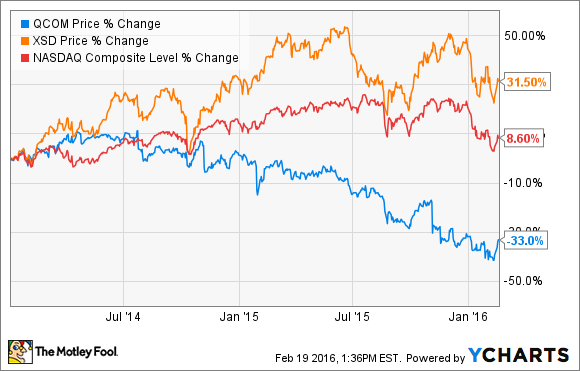 Qualcomm's patent licensing troubles have weighed on its shares in recent years. The company generates the bulk of its profits, but not revenues, by collecting licensing fees from its patent war chest, many of which relate to 3G and 4G mobile connectivity. Those patents have allowed its Qualcomm Technology Licensing (QTL) division to collect a royalty fee of up to 5% of the retail price for every cellular device activated. Over the past decade, the explosion of smartphone sales has fueled a boom market for Qualcomm's licensing division. But then some handset makers, particularly those in China, simply stopped paying the legally required royalty rates. In the most recent example, Qualcomm saw QTL revenues decline 12% in its most recently reported quarter, even as overall reported relevant cellular device sales increased roughly 7% to $60 billion in its most recent quarter. But what about those dispersing headwinds in the years to come? At its Feb. 11 analysts day, Qualcomm struck a positive tone regarding QTL's outlook. The company expects a material improvement in QTL sales, saying it sees revenues in the division increasing from roughly $8 billion this year to $10 billion by 2020. And it's this outlook that could make Qualcomm one of the most interesting stocks in the semiconductor space today. Getting a struggling segment back to growth should have a positive impact on the company's stock price -- but to what extent? Using Qualcomm's full-year 2015 results as a frame of reference, here's how QTL growth to $10 billion in licensing revenue by 2020 would affect the company's bottom line. Source: Qualcomm investor relations. QTL= Qualcomm Technology Licensing. QCT = Qualcomm CDMA Technologies . This outlook assumes a few things, such as no growth from Qualcomm's chip-sales business, a stable tax rate, and an unchanged share count -- all of which are also likely to change. However, for illustrative purposes, QTL licensing growth alone would translate into an average annual return of only 3.6% for Qualcomm investors. That's far from compelling. Some investors aren't impressed, either. In the wake of its analyst day, several analysts have questioned the viability of Qualcomm's projections. For starters, the long-term trend of declining average device sales prices means the company will collect less on new devices, implying a declining marginal growth rate for licensing revenue. Beyond that, the compliance issue still looms. Regulators in both China and Europe have attempted to crimp Qualcomm's licensing claims, which presents an important potential overhang for QTL's business model. These points deserve consideration. But QTL growth isn't the only aspect of Qualcomm's growth story that bears discussion. Though the company doesn't often surface in discussions among income investors, Qualcomm's dividend growth story is one of the more impressive in all of tech over the past decade. Source: Qualcomm investor relations. LTM = last 12 months. CAGR = compound annual growth rate. Qualcomm's dividend growth has been prodigious, and it's here that the depressed share price serves prospective investors well. Shares currently yield 3.9%. Combining that impressive yield with its P/E ratio of 16 creates an argument that the stock is cheap on a relative and absolute basis. So while it might not be the most enticing name in the semiconductor space, Qualcomm's relatively cheap shares and multiple potential growth drivers make it at least worth additional consideration for tech investors today.